American physicist E. M. Purcell developed the principles of nuclear magnetic resonance (NMR) in 1946, now used in chemistry and physics to determine the molecular structure of materials and mixtures. NMR is also the technology that provides the basis for magnetic resonance imaging (MRI), a tool for medical diagnosis. He was awarded the 1952 Nobel Prize for Physics, with co-recipient Felix Bloch, who conducted much the same research independently, and reached the same conclusions in his work at Stanford. 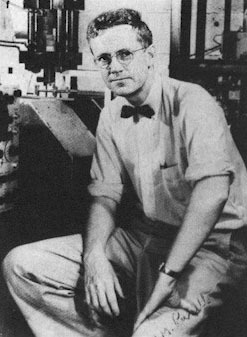 During World War II Purcell worked at the MIT Radiation Laboratory, as part of the team that developed microwave radar. In 1951 he discovered microwave emissions from the neutral hydrogen of interstellar space. Because hydrogen is present throughout the known universe, this became a key tool in radio astronomy, allowing advanced mapping of the known galaxy. In 1953, with his graduate student Stephen Smith, he described what is now called the Smith-Purcell effect, whereby visible light is generated as an energetic beam of electrons is aimed near the surface of a ruled optical diffraction grating. His father was a senior technician for a regional phone company, and as a boy Purcell was allowed to play with discarded equipment and read electronics journals, which he later said ignited his scientific curiosity. He served on the Science Advisory Committee for Presidents Dwight D. Eisenhower, John F. Kennedy, and Lyndon B. Johnson until 1965, when he resigned in protest over the escalating war against Vietnam. From that point forward, he refused all military-related committees and work. He believed that manned space exploration beyond the local planets would be impossible, due to the effects of relativity on high-speed interstellar travelers.